I am 36 years old, and had never heard of the pineal gland. It is a gland located in the middle of the brain, and has something to do with melatonin production. I am still unclear on exactly what function it has. The first time I heard it was when I was told Mr. J had an enlarged pineal gland. It's taken me a while to write this. Partly because I needed to process everything, and partly because we needed to wait until we had as much info as possible, so that we could tell him. After his CT in the fall (when he collapsed at the doctors office) we received a phone call that they actually DID see something in the scan. The CT showed an enlarged Pineal Gland. I had no idea what this was. The nurse from the ER assured me it was likely nothing (it could just be a shadow), but mentioned the other possibilities were a cyst or a very small chance it might be a tumour. Of course, even knowing the probability was low for it to be cancer, that is where my mind went. I did as much research as I could, and indeed did find that the likelihood was low. That didn't stop me from worrying about it week after week. He was referred for an MRI a week later. I was concerned about how he would do with this. We decided not to tell him until the night before, to avoid his worrying too much about it. Hubby and I both went with him, we were even allowed in the room which surprised me. At CHEO they have goggles that hook up to a dvd player, so the kids are able to choose a movie to watch. He did fine with the MRI until they told him they needed to give him a needle with contrast material. He promptly said no thank you, told them he was done and didn't need a needle. It took a few minutes, but with me holding his hand and the technician using a numbing spray we got it done. A week later I got a phone call that they found something and he needed a follow up MRI in 6 weeks - I should call our doctor to discuss the results. I tried my best to NOT freak out. I really did. But when you are told your child has something growing in their brain, that's not an easy thing to do. After I got the call, I met with our family doctor to discuss the results. She told me it was a complex pineal cyst. She said she had put in the requisition for the MRI and also a referral to neurosurgery at CHEO as a precaution. I did a lot more googling while we were waiting. Pretty much everything I read said that they don't do anything about these cysts unless they are causing issues. Up until this point, we hadn't really noticed any issues that were likely associated with the cyst so my mind was slightly eased. Two days later, I had a phone call from the neurosurgeon. Not the office, but the doctor himself. He called me because we were going into the Christmas season, and he wanted me to know that he would see Mr. J after the next scan. He was hoping that he would be able to reassure me that this wouldn't be an issue, and that these cysts are quite common and don't cause symptoms most of the time. The doctor wanted some blood work done, and that we should stop into the lab at the hospital when it was convenient. Mr. J doesn't do well with needles, but we managed to get the blood work done without it being too traumatic for him. While we waited, I was still slightly worrying that there may have been growth during the time between scans. He had his next MRI over the Christmas break and again he did really well with it. They didn't do the contrast this time, so he was happy about that. We had our appointment with the neurosurgeon 4 days later. There had been no change in the scans, which was good news and the blood work came back clear as well. 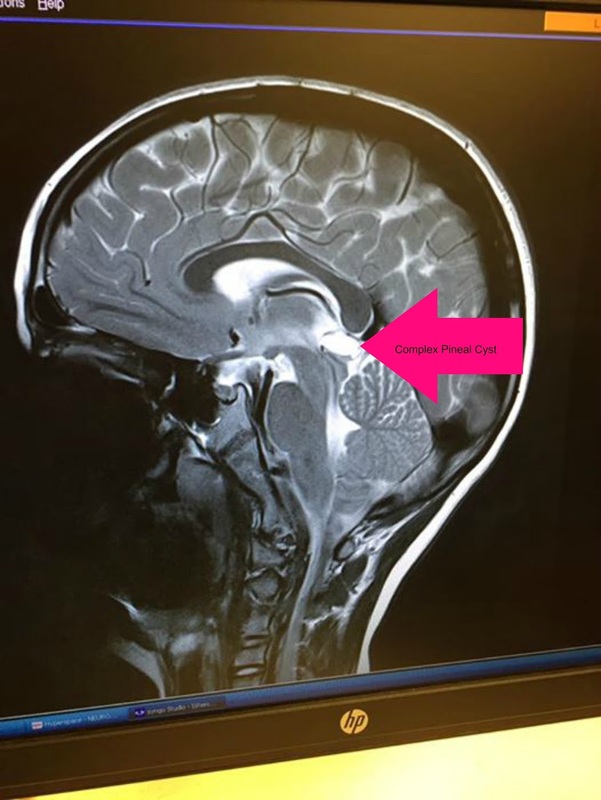 He did say the cyst is larger than they normally see, and is pushing on one canal that brain fluid flows through, but at this point it is not blocking anything. I mentioned that there had been headaches with nausea and vomiting twice in the last week, and was also having a headache and nausea that morning, so they decided to do another scan while we were there to make sure that there hadn't been a change in those few days. We left the doctors office and made our way up to the MRI/CT area. I didn't even have the form filled out and the technician was ready for us - it was quick. This scan showed no changes, so the headache/nausea weren't related. So, now we wait. He will have a follow up scan in 6-9 months (the doctor was hoping for 6 months, but with the braces it affects the picture and he wants a full, good picture so it will likely be closer to 8 months). If that presents with no changes, then he will likely have scans yearly to monitor. Apparently they don't normally continuously monitor these if there is no growth, but because of the large size and the slight pressing on the canal, he has many more scans in his future. Mr. J didn't really know how to process all the information. I asked if he had any questions, but he didn't really want to talk about it. That made me feel better about not giving him any information while we waited (I really struggled with keeping it from him, but as hubby constantly told me, there isn't much to tell when we don't know anything). He thought he was having the tests to try and figure out why he collapsed (which has nothing to do with the cyst). They never did figure out what was going on, but it hasn't happened since. I have to say I am once again amazed at how quickly everything happened. We are fortunate to have some amazing doctors in our life, and our family doctor and pediatrician were both a great support to me while we were waiting for these further tests and appointments. Mr. J really didn't like all these appointments he had to go to. Poor kid missed a ton of school (which would have been fine to him if he was able to stay home or do something fun). We have really gotten to know the halls of CHEO again after many years of not visiting often. Mr. K is struggling with all the attention his brother was getting for those weeks, and is even more clingy to me than he was before. Hubby and I? Not really sure. I am doing ok. Still a little freaked out that this cyst has taken up residence inside his brain, but knowing that it is stable helps a bit. Poor guy...I'm sorry you're all going through this, but glad that we have such a great hospital so close; Cheo is really fantastic. Praying that it doesn't get worse. Thanks Sandy! That is exactly why I am sharing it - the first thing I did was google and it was reassuring to hear others stories. Ashley thank you for sharing your story with us. My prayers are with you and your family. That there is no more growth! Thank you for sharing. Hugs to you. Prayers for a speedy recovery and quick solution. Thanks Margarita - unfortunately there really isn't a "solution". They don't do anything about these cysts unless they are causing issues. Big hugs. That's a lot to be going through, and I imagine the uncertainty makes it all so stressful. Wishing you strength (and Mr. J strength!) through this. Quite a while ago, I read that flouride can damage the pineal gland. I'm talking from the water you drink to the toothpaste you use. Fluoride can accumulate and calcify on the gland, blocking its effectiveness, and these deposits can get worse as we age. Hope your little guy gets better soon. Oh, I also wanted to mention that if you put Emla cream on the veins about a half hour before your son need bloodwork, it will numb the area. Wrap the area with something like Saran wrap. I worked in a hospital laboratory for over 20 years, and this really works. we did use the emla for the bloodwork! What a thing to go through! I'm happy that things are stable. I hope your little guy is doing well and doesn't have any more appointments anytime soon! It is great that you are close enough to go to a children's hospital like CHEO. Having staff that are experience in working with kids makes a world of difference. Sable is good, and I am glad that they are actively monitoring him. I think that will give you peace of mind in the long run. You are so strong to go thru something like that and your little boy is too! Speedy recovery to the little man. I was so sorry to read of all that you and your family have been going through and hope that follow-up scans will help to ease your mind. I was 16 when a CT discovered I had a pineal region benign cyst. Now 42 and doing great. I'm the 42 yr old. I had yearly mri's for 25+years. Just went this year again and all is well. I've had 2 babies c-section as precaution and neuro surgeon advised. All is well. Count your blessings, eat a whole wonderful diet and stay hydrated(drink water!) and live life(I did mini triathlons eat). All my best. Be happy! It's so scary when there is something wrong with our kids. I'm glad to hear that things are stable and wish your family the best. Thanks for the post. Would be scary for anyone. Thanks for sharing. I can somewhat relate to this! Has anyone told you of Arnold Chiari Malformation? That image clearly shows it. That's also to blame for those headaches and nausea. I would love to talk with you more. I have Chiari and so do my sons. Here's an image of a "normal" brain. Without any crowding or herniation. Please feel free to email me! I really would like to talk with you more! So sorry to hear your son has to go through all this but i'm so happy things are stable.So happy he has a strong Mama!